OS - Relations - Could the two anticyclonic eddies during winter 2003/2004 be reproduced and predicted in the northern South China Sea? Could the two anticyclonic eddies during winter 2003/2004 be reproduced and predicted in the northern South China Sea? 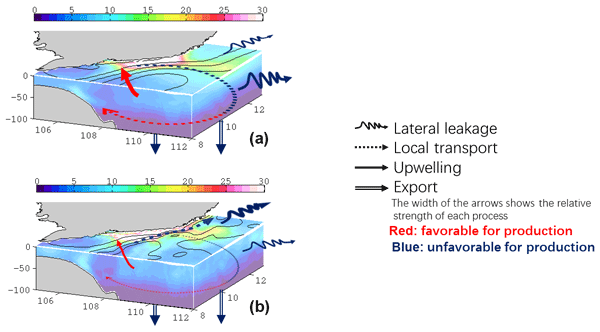 In this study, we investigate the physical factors controlling the biological production in a coastal upwelling system, the Vietnam boundary upwelling system in the South China Sea. We found that, in addition to the effects from the wind (as a major factor driving the ocean), the ocean circulation could also contribute positively to the production here, which is distinct from other major coastal upwelling systems. Bleck, R.: An oceanic general circulation model framed in hybrid isopycnic cartesian coordinates, Ocean Model., 4, 55–88, 2002. Boyer, T. P., Levitus, S., Antonov, J. I., Locarnini, R. A., and Garcia, H. E.: Linear trends in salinity for the World Ocean, 1955–1998, Geophys. Res. Lett., 32, 67–106, 2005. Chassignet, E. P., Hurlburt, H. E., Smedstad, O. M., Halliwell, G. R., Hogan, P. J., Wallcraft, A. J., Baraille, R., and Bleck, R.: The HYCOM (Hybrid Coordinate Ocean Model) data assimilative system, J. Marine Syst., 65, 60–83, 2007. Chelton, D. B., Schlax, M. G., and Samelson, R. M.: Global observations of nonlinear mesoscale eddies, Prog. Oceanogr., 91, 167–216, 2011. Cheng, X. H., Qi, Y. Q., and Wang, W. Q.: Seasonal and Interannual Variabilities of Mesoscale Eddies in South China Sea, J. Trop. Oceanogr., 24, 51–59, 2005. Counillon, F. and Bertino, L.: Ensemble Optimal Interpolation: multivariate properties in the Gulf of Mexico, Tellus, 61A, 296–308, 2009. Dai, A. and Trenberth, K. E.: Estimates of freshwater discharge from continents: latitudinal and seasonal variations, J. Hydrometeorol., 3, 660–685, 2002. Ducet, N., LeTraon, P. Y., and Reverdin, G.: Global high-resolution mapping of ocean circulation from TOPEX/Poseidon and ERS-1 and-2, J. Geophys. Res., 105, 19477–19498, 2000. Frenger, I., Gruber, N., Knutti, R., and Münnich, M.: Imprint of Southern Ocean eddies on winds, clouds and rainfall, Nat. Geosci., 6, 608–612, 2013. Fu, L.-L., Chelton, D. B., Traon, P.-Y. L., and Rosemary, M.: Eddy dynamics from satellite altimetry, Oceanography, 23, 14–25, 2010. Halliwell, J. G. R.: Evaluation of vertical coordinate and vertical mixing algorithms in the HYbrid-Coordinate Ocean Model (HYCOM), Ocean Model., 7, 285–322, 2004. Halliwell, J. G. R., Bleck, R., and Chassignet, E. P.: Atlantic Ocean simulations performed using a new Hybrid Coordinate Ocean Model (HYCOM), EOS, Fall AGU Meeting, Trans. AGU, 1998. Halliwell, J. G. R., Bleck, R., Chassignet, E. P., and Smith, L. T.: Mixed layer model validation in Atlantic Ocean simulations using the Hybrid Coordinate Ocean Model (HYCOM), EOS, 80, OS304, 2000. Hamilton, P., Fargion, G. S., and Biggs, D. C.: Loop Current eddy paths in the western Gulf of Mexico, J. Phys. Oceanogr., 29, 1180–1207, 1999. Han, Y.–J. : A numerical world ocean general circulation model: Part II. A baroclinic experiment, Dynam. Atmos. Oceans, 8,141–172, 1984. Huang, B. Q., Hua, J., Xu, H. Z., and Wang, D.: Phytoplankton community at warm eddies in the northern South China Sea in winter 2003/2004, Deep-Sea Res. Pt. II, 57, 1792–1798, 2010. Jia, Y., Liu, Q., and Liu, W.: Primary studies of the mechanism of eddy shedding from the Kuroshio bend in Luzon Strait, J. Oceanogr., 61, 1017–1027, 2005. Kara, A. B., Rochford, P. A., and Hurlburt, H. E.: Air-sea flux estimates and the 1997–1998 ENSO event, Bound.-Lay. Meteorol., 103, 439–458, 2002. Large, W. G., McWilliams, J. C., and Doney, S. C.: Oceanic vertical mixing: a review and a model with a nonlocal boundary layer parameterization, Rev. Geophys., 32, 363–403, 1994. Legates, D. R. and Willmott, C. J.: Mean seasonal and spatial variability in gauge-corrected, global precipitation, Int. J. Climatol., 10, 111–127, 1990. Li, L., Nowlin, W. D., and Su, J, L.: Anticyclonic rings from the Kuroshio in the South China Sea, Deep-Sea Res. Pt. I, 45, 1469–1482, 1998. Li, Q. Y. and Sun, L.: Technical Note: Watershed strategy for oceanic mesoscale eddy splitting, Ocean Sci., 11, 269–273, https://doi.org/10.5194/os-11-269-2015, 2015. Li, Q. Y., Sun, L., Liu, S.-S., Xian, T., and Yan, Y. F.: A new mononuclear eddy identification method with simple splitting strategies, Remote Sens. Lett., 5, 65–72, https://doi.org/10.1080/2150704X.2013.872814, 2014. Li, Q.-Y., Sun, L., and Lin, S.-F.: GEM: a dynamic tracking model for mesoscale eddies in the ocean, Ocean Sci., 12, 1249–1267, https://doi.org/10.5194/os-12-1249-2016, 2016. Li, X. C.: Applying a new localization optimal interpolation assimilation module to assimilate sea surface temperature and sea level anomaly into the Chinese Shelf/Coastal Seas model and carry out hindcasted experiment, Graduate University of the Chinese Academy of Sciences, Beijing, China, 92 pp., 2009. Li, X. C., Zhu, J., Xiao, Y. G., and Wang, R.: A Model-Based Observation Thinning Scheme for the Assimilation of High-Resolution SST in the Shelf and Coastal Seas around China, J. Atmos. Ocean. Tech., 27, 1044–1058, 2010. Liu, Z., Yang, H. J., and Liu, Q.: Regional dynamics of seasonal variability of sea surface height in the South China Sea, J. Phys. Oceanogr., 31, 272–284, 2001. Morrow, R. and Traon, P.-Y. L.: Recent advances in observing mesoscale ocean dynamics with satellite altimetry, Adv. Space Res., 50, 1062–1076, 2012. Oey, L. T., Ezer, T., and Lee, H. C.: Loop Current, rings and related circulation in the Gulf of Mexico: a review of numerical models, in: Circulation in the Gulf of Mexico: Observations and Models, Volume 161, American Geophysical Union, 31–56, 2005. Oke, P. R., Allen, J. S., Miller, R. N., Egbert, G. D., and Kosro, P. M.: Assimilation of surface velocity data into a primitive equation coastal ocean model, J. Geophys. Res.-Oceans, 107, 5-1–5-25, 2002. Oke, P. R., Brassington, G. B., Griffin, D. A., and Schiller, A.: Ocean data assimilation: a case for ensemble optimal interpolation, Aust. Meteorol. Ocean., 59, 67–76, 2010. Reynolds, R. W., Smith, T. M., Liu, C., Chelton, D. B., Casey, K. S., and Schlax, M. G.: Daily High-Resolution Blended Analyses for Sea Surface Temperature, J. Climate, 20, 5473–5496, 2007. Rio, M. H., Mulet, S., and Picot, N.: Beyond GOCE for the ocean circulation estimate: Synergetic use of altimetry, gravimetry, and in situ data provides new insight into geostrophic and Ekman currents, Geophys. Res. Lett., 41, 8918–8925, 2014. Treguier, A. M., Chassignet, E. P., Boyer, A. L., and Pinardi, N.: Modeling and forecasting the “weather of the ocean” at the mesoscale, J. Mar. Res., 75, 301–329, 2017. Uppala, S., Kallberg, P., Simmons, A. J., Andrae, U., Da Costa Bechtold, V., Fiorino, M., Gibson, J. K., Haseler, J., Hernandez, A., Kelly, G. A., Li, X., Onogi, K., Saarinen, S., Sokka, N., Allan, R. P., Andersson, E., Arpe, K., Balmaseda, M. A., Beljaars, A. C. M., Van De Berg, L., Bidlot, J., Bormann, N., Caires, S., Chevallier, F., Dethof, A., Dragosavac, M., Fisher, M., Fuentes, M., Hagemann, S., Hólm, E., Hoskins, B. J., Isaksen, L., Janssen, P. A. E. M., Jenne, R., Mcnally, A. P., Mahfouf, J.-F., Morcrette, J.-J., Rayner, N. A., Saunders, R. W., Simon, P., Sterl, A., Trenberth, K. E., Untch, A., Vasiljevic, D., Viterbo, P., and Woollen, J.: The EAR-40 re-analysis, Q. J. Roy. Meteor. Soc., 131, 2961–3012, 2005. Vos, M. D., Backeberg, B., and Counillon, F.: Using an eddy-tracking algorithm to understand the impact of assimilating altimetry data on the eddy characteristics of the Agulhas system, Ocean Dynam., 68, 1071-1091, 2018. Wang, D. X., Zhou, F. Z., and Qin Z. H.: Numerical simulation of the upper ocean circulation with two-layer model, Acta Oceanol. Sin., 18, 30–40, 1996. Wang, D., Xu, H., Lin, J., and Hu, J.: Anticyclonic eddies in the northeastern South China Sea during winter 2003/2004, J. Oceanogr., 64, 925–935, https://doi.org/10.1007/s10872-008-0076-3, 2008. Wang, G., Su, J., and Chu, P. C.: Mesoscale eddies in the South China Sea observed with altimeter data, Geophys. Res. Lett., 30, 2121, https://doi.org/10.1029/2003GL018532, 2003. Wang, Z., Li, Q., Sun, L., Li, S., Yang, Y., and Liu, S.: The most typical shape of oceanic mesoscale eddies from global satellite sea level observations, Front. Earth Sci., 9, 202–208, https://doi.org/10.1007/s11707-014-0478-z, 2015. Woodham, R. H., Alves, O., Brassington, G. B., Robertson, R., and Kiss, A.: Evaluation of ocean forecast performance for Royal Australian Navy exercise areas in the Tasman Sea, J. Oper. Oceanogr., 8, 147–161, 2015. Woodruff, S. D., Slutz, R. J., Jenne, R. L., and Steurer, P. M.: A comprehensive ocean-atmosphere data set, B. Am. Meteorol. Soc., 68, 1239–1250, 1987. Wu, C. R. and Chiang, T. L.: Mesoscale eddies in the northern South China Sea, Deep-Sea Res. Pt. II, 54, 1575–1588, 2007. Xiao, X. J., Wang, D. X., and Xu, J.-J. : The assimilation experiment in the southwestern South China Sea in summer 2000, Chinese Sci. Bull., 51, 31–37, 2006. Xie, J., Counillon, F., Zhu, J., and Bertino, L.: An eddy resolving tidal-driven model of the South China Sea assimilating along-track SLA data using the EnOI, Ocean Sci., 7, 609–627, https://doi.org/10.5194/os-7-609-2011, 2011. Xie, J. P., Bertino, L., Cardellach, E., Semmling, M., and Wickert, J.: An OSSE evaluation of the GNSS-R altimetery data for the GEROS-ISS mission as a complement to the existing observational networks, Remote Sens. Environ., 209, 152–165, 2018. Xu, D. Z., Li, X. C., Zhu, J., and QI, Y. Q.: Evaluation of an ocean data assimilation system in the marginal seas around China, with a focus on the South China Sea, Chin. J. Oceanol. Limn., 29, 414–426, 2011. Xu, D. Z., Zhu, J., Qi, Y. Q., LI, X. C., and Yan, Y. F.: Impact of mean dynamic topography on SLA assimilation in an eddy-resolving model, Acta Oceanol. Sin., 31, 11–25, 2012. Yan, C. X., Zhu, J., and Zhou, G. Q.: Impacts of XBT, TAO, altimetry and ARGO observations on the tropic Pacific Ocean data assimilation, Adv. Atmos. Sci., 24, 383–398, 2007. Yang, K., Shi, P., Wang, D. X., You, X. B., and Li, R. F.: Numerical study about the mesoscale multi-eddy system in the northern South China Sea in winter, Acta Oceanol. Sin., 22, 27–34, 2000. Yang, S., Xing, J., Chen, D., and Chen, S.: A modelling study of eddy-splitting by an island/seamount, Ocean Sci., 13, 837–849, https://doi.org/10.5194/os-13-837-2017, 2017. Yuan, S. Y. and Wang, Z. Z.: Topography forced Rossby waves in the section from Xisha to Dongsha Islands, Tropic Oceano., 5, 1–6, 1986. Zhai, X., Johnson, H. L., and Marshall, D. P.: Significant sink of ocean-eddy energy near western boundaries, Nat. Geosci., 3, 608–612, 2010. Zhu, J.: Overview of Regional and Coastal Systems, Chapter 17 in Operational Oceanography in the 21st Century, edited by: Schiller, A. and Brassington, G. B., 727 pp., Springer Science, Business Media B.V, Dordrecht, 2011. Zhuang, W., Du, Y., Wang, D. X., Xie, Q., and Xie, S.: Pathways of mesoscale variability in the South China Sea, Chin. J. Oceanol. Limn., 28, 1055–1067, 2010. The reproductivity and predictability of mesoscale eddies in the northern South China Sea are investigated with a focus on two anticyclonic eddies based on an assimilated system. The results show that generation, evolution, and propagation paths of these two eddies can be well reproduced and forecasted when the observed amplitude >8 cm. However, when their amplitudes are <8 cm, the generation and decay of these two mesoscale eddies cannot be well reproduced and predicted by the system.